(08.07.10 RK Apothecary Grand Opening. 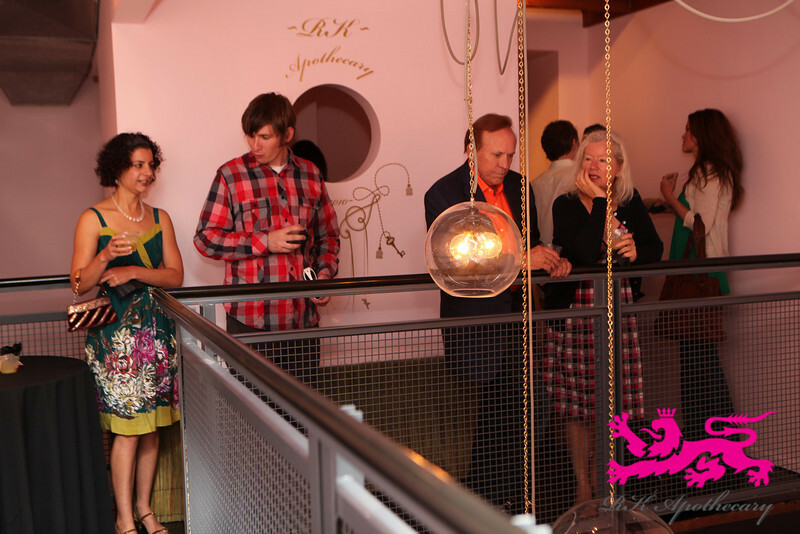 Santa Monica, Ca) RK Apothecary celebrated the first day of being open to the public on Saturday, August 7th. Owner Erica Olson invited guests to preview the store's luxury bath and body products by Mor Cosmetics, Campagnie de Provence, Olivina, Malie Organics, Delirium & Co, Pre de Provence, Lafco NY, and others. Local business owners and a group of young architects sipped cucumber-poblano margaritas and browsed the store's lush interior, designed by The Los Angeles Design Group (The LADG, LLC). Store Description: RK Apothecary offers the best in high-end, luxury bath and body products intended as unique gifts for a special occasion or as a personal indulgence. Apothecaries, long a fixture of European and early American cities, offer a unique retail experience. The setting is intimate, almost like a library in a way that encourages leisurely shopping and hands-on experience with products. Apothecary displays suggest unusual, restorative combinations of products that might not otherwise be found together. It is my hope that customers will enjoy the store as a place to slow down, browse, and enjoy the sensory experiences offered by a refined, artisanal collection. "RK Apothecary" is short for "Rotkätzchen,” which means “Little Red Cat.” The name is an example of how luxury products should play an appropriate role in our lives: objects should be beautiful and carefully crafted, but never too serious. The ornate lion in our logo is borrowed from symbols used by European noble families, but at the same time he’s small and pink. For me luxury is fun, it’s whimsical, it’s of the highest quality, and has nothing to do with power or prestige. Thank you's: Ready 2 Pour (Steven Fowler and Krister Young), Dr. Barb Bowers and Dr. Douglas Olson, The LADG (Andrew Holder, Benjamin Freyinger, Noah Rubin) and Kari Miller. Compliments of RK Apothecary, get your free digital images by right clicking and saving, or dragging straight to your desk top. Enjoy!